The Index opened flat but saw selling pressure from the onset which got aggravated due to RBI governor’s 25bps CRR cute and hawkish statement going forward. The index broke 8400 and 8300 level with ease to close near the lows of the day at 8236.45, huge loss of 196.95 points. The broader market was also weak, with 292 advances to 1206 declines. 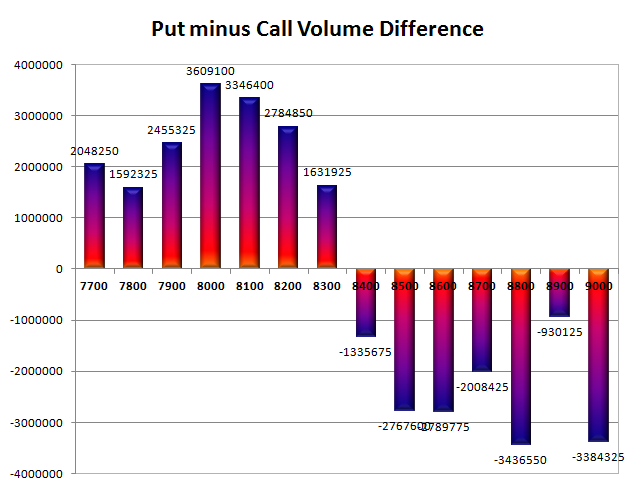 The broader range as per Option Table stays at 8000-8800. Call option 8000-9000 added huge 51.02 lacs OI with profit booking seen at 8700 strike price. 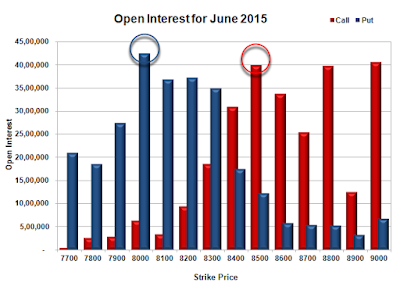 Put option 8300-7700 added huge 28.74 lacs OI with short covering seen at 8400 and above strike prices. Nifty Open Interest is at 1,61,10,750 up by 12,875, with decrease in price, most probably short build-up. 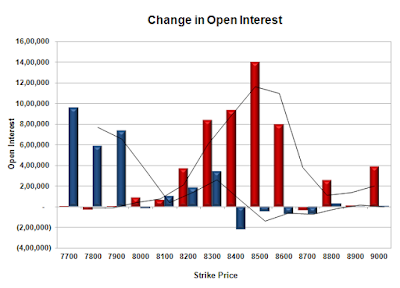 Bank Nifty Open Interest is at 21,82,650 up by 4,40,250, with decrease in price, most probably huge short build-up. FII’s sold huge 25.01 lacs Futures, which includes 48549 contracts long liquidation and 51503 contracts short build-up, with increase in net OI by 2954 contracts (includes 80243 longs to 180295 shorts for the day) and the Average Price comes to 8468.28. FII’s Index future open contract as on date is 348850 Longs to 276302 Shorts, Net Long 72548 contracts. Initial and good support at 8200, with OI of 37.28 lacs and below that at 8000 with OI of 42.50 lacs. Initial resistance at 8300, with OI addition of 8.38 lacs and above that at 8400 with OI of 30.85 lacs. Day Range as per Option Table is 8206 - 8367 and as per VIX is 8164 - 8309 with 8303 as the Pivot.